When Americans change phone providers, we don’t give a second’s thought as to how — or even if — we’ll be able to transfer our old phone numbers to the new provider. We just take for granted that it will happen — instantaneously. 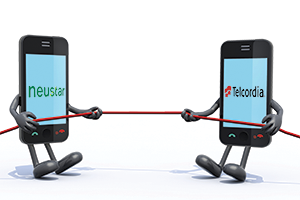 In early June, however, the Federal Communications Commission accidently leaked documents showing that Neustar is in danger of losing the $450 million annual number portability contract to Telcordia, a division of Swedish telecommunications giant Ericsson, which provides number portability services for India. The contract makes up about half of Neustar’s annual revenues. Financial and technology analysts have said they’re worried about the possibility of a “Big Bang Implementation” scenario in which Telcordia would have to build a new system from scratch, which they say could result in service headaches for consumers and major problems for smaller telecommunications carriers. The D.C.-based Competitive Carriers Association, which represents smaller telecom providers across the nation, wrote a letter to the FCC in March, expressing concerns about the possible transition and its impact on smaller carriers in particular. “Competition in the telecommunications marketplace depends on consumer confidence in the ability to seamlessly move between carriers — and among wireline, wireless and VoIP [Voice over Internet Protocol] carriers — without changing telephone numbers,” wrote Rebecca Murphy Thompson, the association’s general counsel. “Absent that assurance, consumers will hesitate to switch carriers, even when an alternative carrier offers lower prices and better services. A spinoff of Lockheed Martin Corp., Neustar was established to create and run the NPAC and has been awarded the contract four previous times without any competition. When it was publicly announced in January that Telcordia was competing for the contract, financial analysts were caught by surprise, says John F. Bright, director and senior research analyst with Avondale Partners LLC. There also are questions about neutrality. Ericsson manufactures telecommunications equipment and Bright ponders whether Telcordia would be in the position to offer better number portability service to companies that purchase from Ericsson. It would be in the best interest of consumers, national security and U.S. telecommunications companies if the FCC allowed Neustar to submit a lower bid than Telcordia, Bright says. Larger carriers such as AT&T and Verizon maintain their own networks and databases based on data from NPAC, but smaller carriers often rely heavily on Neustar’s suite of services for managing networks and phone number databases, Buckley says. The drama over the NPAC contract started last year. The contract process is overseen by the North American Portability Management LLC and the North American Numbering Council, groups made up largely of representatives from major telecom corporations such as Verizon, T-Mobile and AT&T. The final contract goes to the FCC for approval. In June, the FCC announced that the North American Numbering Council unanimously recommended that the contract be awarded to Telcordia. Neustar stock fell 8.4 percent the day of the announcement. Additionally, Buckley says, Neustar expected to be able to submit revised lower bids during the contract selection process, but the North American Portability Management rejected a revised bid from Neustar last October. The FCC ended a comment process for the NPAC contract in July, and it’s unclear when the actual contract may be awarded, since the FCC has delayed or missed several dates, Buckley says. It could be well into 2015 before the situation is resolved, as Neustar vows to continue fighting for the contract.